Shichida lessons are exciting and intriguing! Most children tell us that they cannot wait to come to their next lesson. Each fifty-minute lesson is packed with challenging activities. 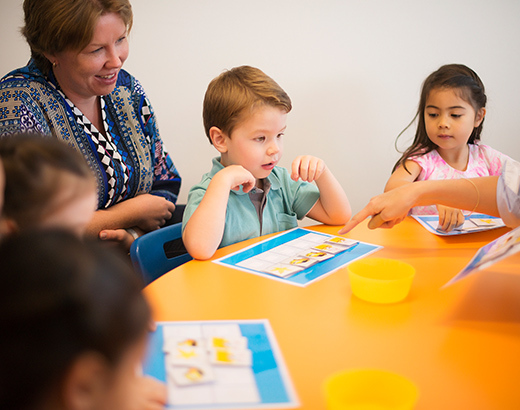 Trained instructors conduct a series of unique activities, including brain-stimulating flashcards, dot cards, image training, and memory games, devised to hold children's attention. Classes are conducted with a maximum of six children and their parents. Yes, the parents. Parents play a significant role in Shichida lessons, especially in younger children's lessons*. They sit right behind their child and take the lessons alongside them. Parents are often amazed at what their children can do and quickly learn about their role as a parent: love, praise and accept. They discover the correct balance of parent involvement that promotes their child’s independence. Shichida classes are for parents as much as they are for children. *Depending on the child’s readiness, between three and four years old, we ask parents to step away from the lesson. Classes for older children are usually conducted without their parents present in the classroom. Shichida instructors are carefully selected from among many candidates. To become qualified as a certified Shichida instructor, individuals must go through rigorous training and testing provided by the Shichida headquarters in Japan. Also, the instructors continuously engage in training and continued education so that they can deliver top-quality lessons. Since the instructor holds the key to lesson success, peer and managerial critiques are also regularly conducted to ensure our instructor quality. Finally, periodical workshops are held to update instructors on the newest educational methods. Shichida instructor certificates are only valid at official Shichida Centers. Centers are located in populated areas where many young families live. They are conveniently located in shopping malls and residential areas. Center interiors must meet specific standards so that everyone can receive the best lesson experience possible. The Shichida Center certificates issued by SEI Headquarters in Japan must be prominently displayed in each Center and are proof that the center is an official Shichida Center. During operating hours, you can always hear children's delighted voices emerging from the Center. Remember to look for a Shichida logo wherever you go. Our employees are waiting to greet you with a smile!